Full 24 10/100 Smart Switch with 24 PoE Ports. Four gigabit ports for high speed connections. NETGEAR ProSafe Smart Switches fill the gap between unmanaged and fully managed switches. The family of ProSafe Smart Switches is designed for growing businesses that want control over their network without the cost and complexity of a full Layer 2/Layer 3 management implementation. This PoE-capable Smart Switch, the FS728TP, provides power and data using built-in IEEE 802.3af PoE on all 24 ports. In addition, the FS728TP offers an intuitive Webbased management tool for quick and easy deployment and configuration making it ideal for deploying access points, VoIP phones and IP-based surveillance cameras. This switch is equipped with highly advanced features such as access control lists (ACL), 802.1x port authentication, enhanced QoS, rate limiting and IGMP snooping among others to provide a small and medium-sized business with a network that is geared for growth while providing scalability and reliability. 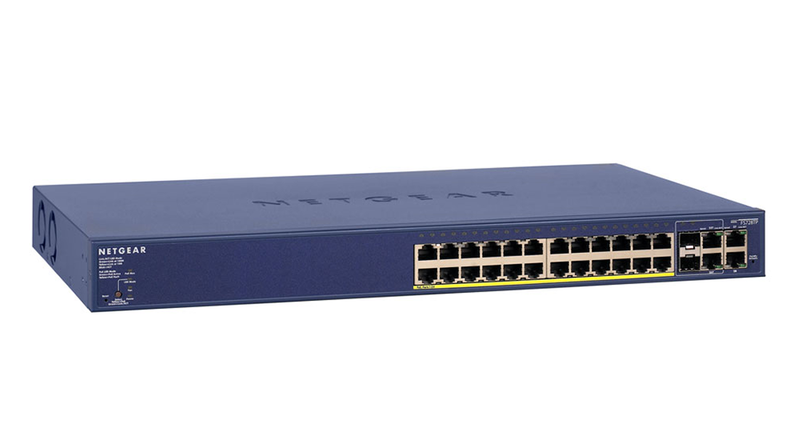 With the utility of 24 10/100 Mbps ports, four copper 10/100/1000 Mbps ports and two combination (copper/hot-swappable small form-factor pluggable (SFP)) Gigabit ports for optional fiber connectivity, growing business networks, classrooms and workgroups can benefit from superior performance and keep up with expanding network needs. This high-performing switch features a non-blocking wire-speed architecture with an 12.8 Gbps switching capacity for maximum data throughput. All 28 RJ-45 ports automatically negotiate to the highest speed and support Auto Uplink™ technology to make the right link.